I have to start of by saying that the Large Play Set on the Farm is another brilliant toy from HABA. 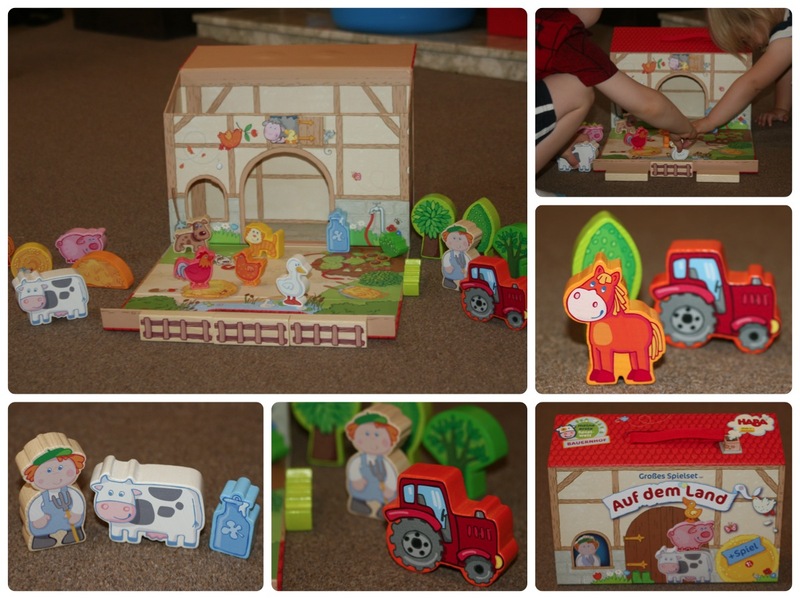 The toy features 22 wooden characters including farmer, animals, tractor and trees that all come in a strong cardboard box! The box doubles up as part of the play set and becomes the farm house! When I got this out the kids eyes were full of excitement when we opened this up, they just wanted to get on and play straight away! The wooden pieces are beautifully made, smooth edges and lovely colours, they are a perfect size for grasping and are durable enough to be played with! The box, although made of cardboard seems sturdy enough to take the play and is great for storage too! Both Mouse (2) and Legs (4) enjoyed playing with it (together I may add, yep they shared it!! ), the box says 18 Months plus and I think that is a good guide! It could be bought for younger child though, as the pieces are so lovely, it could be displayed in the nursery until they are old enough to play! The thing I love most about this toy is that it is great for imaginative play and it isn’t full of buttons to make things happen! The children can use it as an aid in their games and they have to make the noises themselves, create the conversations and develop their story…. The kids love it too, a great addition to anyones toy box and would make a lovely gift too.